Hi, I’m Maura and I live in Northern Ireland with my husband Ronan, who I’ve been married to for 23 years and our five boys: John 22, Ryan 21, Shane 19, Ronan 16 and Jack, our swan. When Jack was born he was small and was in intensive care and on oxygen. He suffers from a few problems now – scoliosis (where the spine twists and curves to the side), arthrogryposis (multiple curved joints in the body), low muscle tone, and is tube-fed over 24 hours due to low blood sugar. He has ongoing kidney problems, kidney reflux, no sight in his left eye, no speech and no mobility. He has two diagnoses – RYR-1 myopathy and malignant hyperthermia but they don’t explain everything Jack has. As a result, he has just been entered on the 100,000 Genomes Project. I have malignant hyperthermia too but I’m not symptomatic like Jack so we’re looking for a piece of the missing puzzle. Jack’s dad works full-time and I’m Jack’s full-time carer. My other boys have done remarkably well considering the time we’ve had to be away from home for Jack’s hospital admissions which are every 10-12 weeks at Great Ormond Street Hospital. This means overnight trips, which are always tough for our other boys to deal with. They don’t let it get to them though and have done really well in school – three are at university and one has just done extremely well in his GCSEs. They are amazing with Jack and don’t wrap him up in cotton wool. We were always told that Jack would never be able to walk or use a wheelchair so our mission was to get him into one and he’s very independent in it. He can also stand independently for up to 10 seconds now. Jack is full of life and loves life. He has a cheeky personality and a great sense of humour. If you say ‘ouch’, he’ll just laugh. He is so happy and this helps us if we are having a bad day – we can look at him and think every day is tough for him so it gives us the strength to keep going. Having an undiagnosed child means the unknown – Jack is youngest of five and our other four are a lot older and are all healthy. As we know that he has a genetic condition his siblings have to be checked because I’m a carrier too. They’re starting to ask questions about genetics and it’s hard as you don’t want them starting relationships having to worry about things like this. I know they would cope with it and they love Jack but it’s the uncertainty of everyday life that’s hard. I never knew any other undiagnosed families until I joined SWAN UK, but since being a member I’ve been on nearly every event for Northern Ireland and even went to Edinburgh a few years ago with families from Northern Ireland to meet up with other SWAN UK families. A couple of us live close by so meet up for dinner, go for coffee or go to each other’s houses. In the summer I helped organise a trip for families to Tayto Park. I got to meet families I hadn’t met before and spoke to one parent who has the same condition as Jack and me so it was helpful finding out more. Jack enjoyed the lake and the circus and I think the event was a great support for everyone. Now that I’ve met new people face to face it makes it easier to talk to them about other things afterwards through the Facebook group. Having events like this takes away the isolation you can feel as we are all in the same boat and know what it feels like to not have a diagnosis how hard it can be. 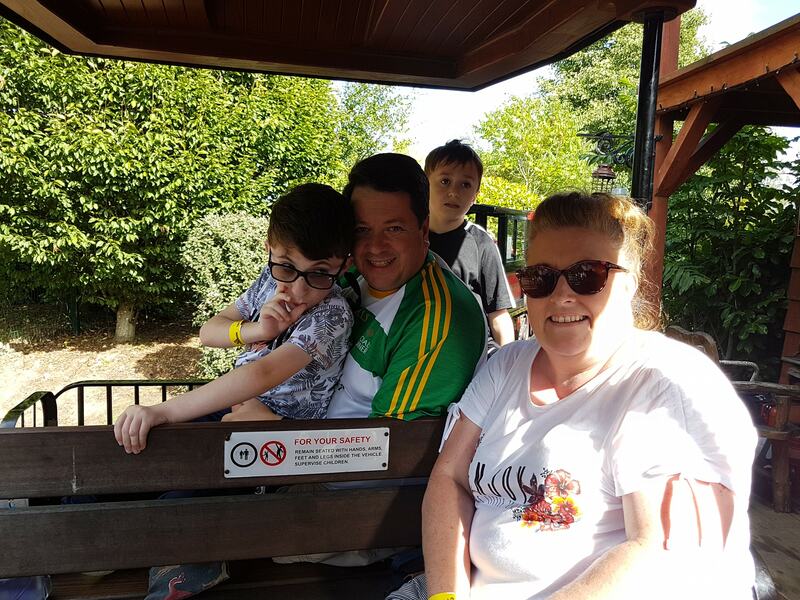 At Tayto Park there were two families whose children had been diagnosed with a similar rare condition so to see them meeting up and comparing notes means an awful lot. Some families I met had younger children and are at the start of their journey and I always send a Facebook friend request after meeting someone so we can stay in touch and they can send me a message if there is something they want to know about. Knowing that I can help them makes me feel good as I’ve had the same help from other parents. Going to an event like this is easier with SWAN UK. Other people don’t get it when you talk about all the tests you have had over the years, but other undiagnosed families understand, and as a SWAN UK member there is always somebody there to talk to or give you a hug. WOULD YOU LIKE TO SHARE YOUR STORY AND HELP RAISE AWARENESS OF UNDIAGNOSED GENETIC CONDITIONS?